Do you service my area, and is there a delivery charge? Zero Gravity Bouncers is located in Euclid, Ohio and offers free delivery within a 20 mile radius of Euclid, Ohio. We do service other areas, though some may incur a delivery charge. Can I pick the inflatable bouncer or slide up at your location, and set it up myself? 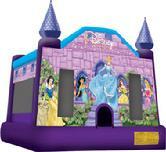 For safety reasons, all of FunBouncers inflatables must be set up and taken down, by a representative of FunBouncers. Due to the sheer size of our bouncers (some are 300 plus pounds), no customer pick ups are permitted. Besides, it's best to leave the work to us. How big are these bouncers? Each bouncer is 15 foot by 15 foot (15x15). How big are Combos slides, and how much room do I need to rent one? Our inflatable combo slides measure 19 feet in length, 16 feet wide, and are 16 feet high. To ensure that you have proper clearance for a slide, make sure that the area where you would like to setup is at least 30x15 with at lease 24 feet overhead clearance. How many children can bounce at a time? However keep in mind that compatible sized children MUST play on the unit at the same time, REGARDLESS of age. Different sized children must not be mixed. Please remember, the above is a guideline only. It all depends on the size of the childern, and how active they are. Toddlers you can get more in, since they are smaller, and less "bouncy." If it\'s all girls, then you can have more in there. All boys, the number may be less. Boys tend to be a bit, ..... well ....., yeah, a bit like boys. Remember, you want to keep them safe. If needed, split them into groups. Give each group ten minutes in the bounce house. What kind of area can bouncers or slides be set up in? You will need a somewhat flat grassy area that is clean of debris (sticks, stones, mud, etc. ), tree roots, or pet waste. If you do have a sprinkler system, please advise us before setting up. For proper clearance, you will need at least a 20x20 area, with clearance overhead (no power lines, trees, branches, overhangs, etc.) of 20 feet. An electrical outlet needs to be within 100 feet. If you do not have an electrical outlet nearby, a generator will be required. Can inflatable bounce houses or slide be setup on pavement (i.e. cul-de-sacs) or driveways? Yes. Hard surfaces must be smooth and clean. Rough concrete surfaces are too abrasive to the bottom of the inflatable. Does the blower have to run all the time? Yes, the blower keeps the inflatable bounce house or slide inflated. As long as all riders have exited safely, the blower can be unplugged to deflate the bouncer or slide. This is sometimes neccessary to give the adult supervisors a break and to let the children take a breather. How far in advance do I need to reserve a bouncer? ASAP! As soon as you have a confirmed date for your party, we highly recommend that you book your bouncer for that date. Don't wait! There's nothing worse than getting your party organized, then calling up to book a bounce house or slide, and finding that none are available. There is nothing we hate worse than having to turn someone down. However, it happens. If this happens, at best, all we can do is refer you to one of our partner companies, or put you on standby, in the event of a cancellation. Why not just avoid the stress, and book it now. We can book as far as one year in advance. If you have a last minute plans to rent a bounce house, if you've just found out about us, or if your other company is giving your grief, give us a call anyway. We can't promise anything, but alot of times we've had those last minute bookings and were able to get to the party on time. You never know, unless you call us. I've heard they are dangerous. How safe are bounce houses? Bounce houses are very safe, as long as all the rules are followed and common sense is used. Bumps and bruises occasionally can be expected. 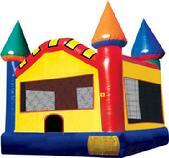 However, most people have a misconception about bounce houses, and think of them as a "baby sitter." Rent a bounce house, and the adults can be left alone. WRONG! Most of the injuries are caused by or happen to unsupervised children. Just as you would not leave children unattended in a swimming pool, do not leave children unattended in a bounce house. They must be supervised at all times, and the rules must be inforced! It will keep the children entertained for hours though, and they will sleep that night! Why are adults not allowed in the bounce houses or slides? With older kids (teens) and adults, more serious injuries occur with long recovery times. Bumps and bruises can be expected in a bounce house. Children typically get bumps and bruises. They remeber that bump or bruise for, ummm, all of about 30 seconds. If your like me, your still feeling it three days later! Adults end up with ruptured disks, back, head and knee injuries and have families depending on them for income. Yes, we would all love to be seven or eight again. Mentally some of us are, but physically ......... it can be serious. Adults will not harm or damage the bouncers. It's always the other way around. Any adults trying to be eight years old again, you are doing so at your own risk! At this time, we do not require a deposit. We accept cash, checks (made payable to "Zer Gravity Bouncers" please), Visa and MasterCard, American Express, and Discover. Please note that there is a $35 NSF fee on all returned checks. It is the customers responsibility to watch the weather. You may be advised by a FunBouncer.net representitive prior to your rental. Once the inflatable is delivered and set up you will be charged regular price, no refunds. For safety reasons, we cannot put bouncers up in the rain. If we don't put the bouncer up, then there's no charge. If the weather looks like it may turn foul, then we reserve the right to cancel the rental, reschedule, or terminate the rental early. Again, safety is our main concern, followed by your satisfaction. Bouncers and bad weather don't mix. If the weather looks like it's taking a turn from good to bad or looks questionable, and you decide to cancel, please call us as soon as possible. What do I need to do to reserve a bounce house? Pick out a level grassy area, 20x20 with at least 20 foot overhead clearance (no branches or power lines). Make sure it's within 100 feet of a power source. Combos require a 15x30 area with 24 foot overhead clearance. Call us at 216-925-2275. We will need your name, address, zip code, telephone number, date and time of party, time of desired delivery. Send out the invites, and be sure to put in there that there will be an inflatable bounce house moonwalk from Zero Gravity Rentals! The day prior to your scheduled rental, we will call to confirm and to give you an estimated delivery time of when we will be there. Reason we ask for time of delivery and time of party? We try and accommodate everyone, and may need to adjust the delivery time based on that days deliveries. 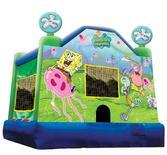 We ask for the time of the party, to ensure that we have the bounce house setup in plenty of time for your party.